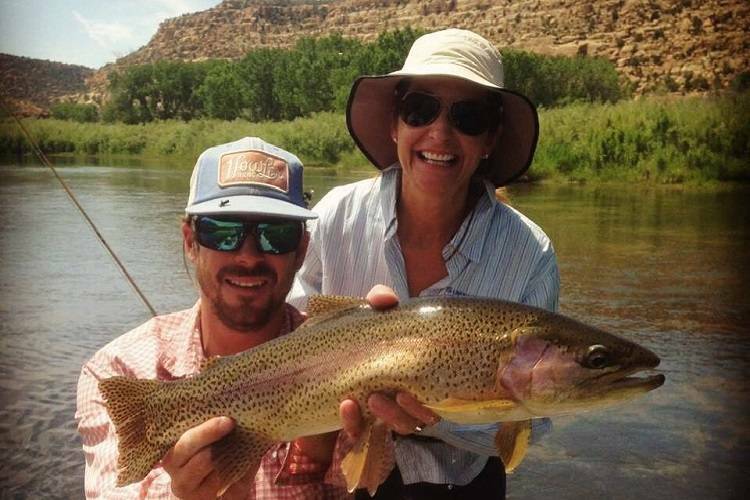 The San Juan River is known for world-class trout fishing . The 4.25 miles of Special Trout Waters at the base of Navajo Dam brings anglers from across the globe for year round fishing. The water released from Navajo Lake is clear, cold and rich in nutrients and sustains one of the most prolific trout populations in North America in terms of size and quantity. The special trout waters of the San Juan River are often referred to as ‘Quality Waters’. Teeming with more than 80,000 rainbow and brown trout, averageing 17 inches in length, this is one of the most rewarding trout fisheries in the world. The Quality Waters section is catch and release only and requires the use of flies and artificial lures with a single barbless hook. Along the San Juan River and outside of Quality Waters regular state fishing guidelines apply, and the the fishing is outstanding! Explore Navajo Lake State Park and the San Juan for an unforgettable fishing adventure. Learn the secrets of the San Juan and Navajo Lake with a professional guide. Full and half day guide service are available. The Farmington Convention & Visitors highly reccomends the following guides.